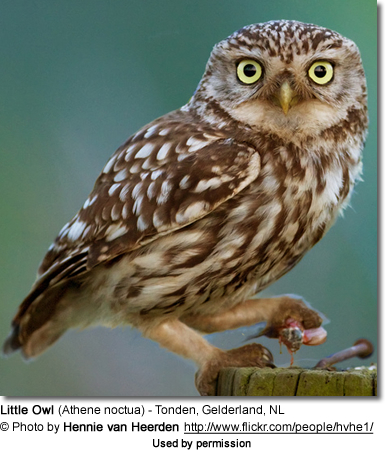 The Little Owls (Athene noctua) have an extremely large range across Europe and Asia and rank amongst the most numerous owl species. Their Latin name "Athene" symbolizes their association with the Greek goddess of Wisdom - Athena, who in artwork is often accompanied by a small owl (believed to be a "Little Owl") as a symbol of watchfulness and wisdom. The late Florence Nightingale - a famous nurse who was often referred to as the "Mother of Modern Nursing" - rescued an owl chick that had fallen from its nest in Athens, Greece. She named the owl " Athena." This owl then became her devoted companion. The owl would perch on her mistress’s finger for feedings and often travelled with her in her pocket. This owl died in 1855 and its preserved remains are now on display in the Florence Nightingale museum in London. The Little Owls are common and resident (non-migratory) in much of the temperate and tropical regions of the world, making their home in about 84 countries. They occur from sea level to elevations of about 10,000 feet (~3,000 meters) and on rare occasions up to 15,000 feet (4,600 meters). However, they generally prefer lowland areas due to the milder weather. Their range stretches from Western Europe - their northern limit extending as far north as Britain, Denmark and Latvia; and their southern limit being the horn of Africa; ranging east to Mongolia, China, Vietnam and Korea. Introduced populations have established themselves in Britain: in England, Wales and parts of Scotland; where they are the smallest owls. More recently, they were introduced to the South Island of New Zealand. As far as habitats are concerned, they appear to be seeking out places that most harmonize with their camouflaging plumage, allowing them to blend in, which makes them more difficult to spot by predators. They generally occupy various open or semi-open habitats, including open fields and woodlands, grasslands, steppes, semi-deserts, stony deserts, cliffs, non-wooded mountains, and ravines, gorges and gullies. They have also adapted well to human-modified habitats and have been making their homes in urban areas, villages, parks and on farmland and fruit orchards. Those living close to humans often grow trusting around them. 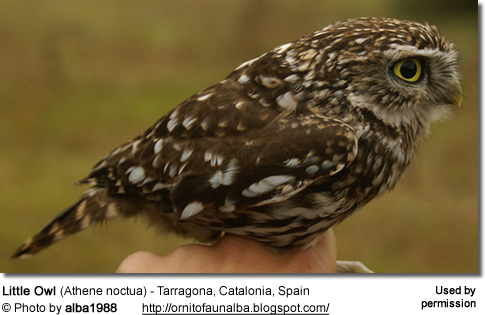 These owls are known to be faithful to their territories, and remain close to their birthplaces for life. 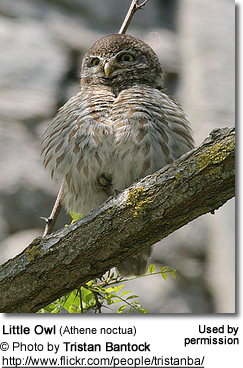 The Little Owls measure from 8.3 - 10.9 inches (21 - 27.5 cm) in length, including the tail. The average wingspan in males is about 22 inches (55.77 cm) and in females about 22.27 inches (56.56 cm). Their weight ranges from 3.46 oz (98 g) to a wild maximum of about 9.9 oz (280 g); and the recorded maximum weight of captive birds is 12.35 oz (350 g); with an average mass of 5.78 oz (164 g). Females tend to be 9 - 10% larger in size and heavier than males. The plumage ranges in color from various shades of grey-brown, rufous-brown to yellowish-brown; although some coloring anomalies have been reported, such as partial albinism, leucistic coloration or a brown plumage with a reddish-orange tinge. They have heavy white or cream "eye brows", white / cream rings around the eyes, a cream-colored chin, and prominent white / cream mottled markings on the wings, back and head, and broader splashes of white on the breast. The cere (skin above the bill) is greyish to black in color; the legs are grey with a possible yellow tinge and the toes are darker grey to brown or black. Females are generally larger and heavier. Males tend to have paler faces. Immature birds have a paler plumage and are uniformly patterned with buff spotting (rather than white). Their bright yellow, forward-facing eyes are nearly as large as human eyes and are immobile within their circular bone sockets. For this reason, owls need flexible necks, as they have to turn the entire head to change views. They have the same number of vertebrae in their necks as most mammals and can move their heads 270 degrees in either direction (nearly all the way around!). Most other bird species have their eyes on the sides of their heads enabling them to see sideways and, to some extent, backwards. Owls, on the other hand, have both eyes in the front which enhances their depth perception. 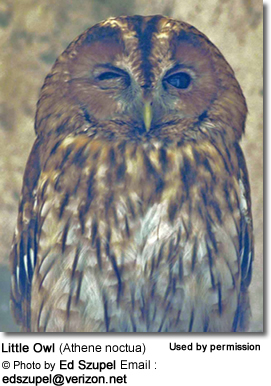 Owls are unable to clearly see anything within a few inches of their eyes. On the other hand, their far vision - particularly in low light conditions - is incredibly good. The color of the eyes tells us a lot about their habits; those with dark brown or black eyes are nocturnal hunters; those with yellow eyes mostly hunt during the day, and those with orange eyes hunt at night and during the day. To protect their eyes, Owls have 3 eyelids: one upper and one lower eyelid, and a nictitating membrane (translucent third eyelid). The upper lid closes when the owl blinks, and the lower closes when the Owl sleeps. The nictitating membrane is a thin layer of tissue that closes diagonally across the eye, from the inside to the outside. These membranes clean, moisten and protect the surface of the eyes. 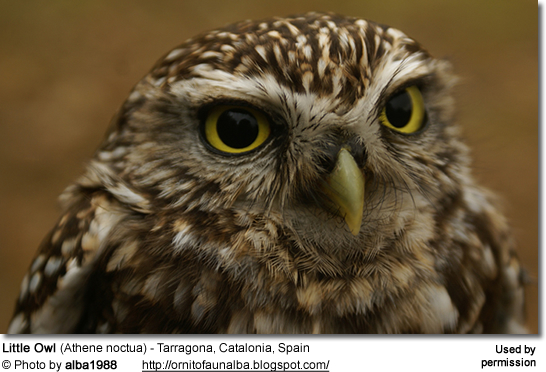 Little Owls are most active at dusk and dawn, but will also hunt at daytime or during the night. They generally fly close to the ground, although have been reported to fly as high as 100 feet (~ 30 meters) above the ground. When sleeping, they will position themselves in a way that will hide their light markings and camouflage themselves into their habitats. To close their eyes, they will raise their lower eyelid. To keep their plumage in good shape, they will perform "rain dances" to clean their feathers; they have been seen "bathing" in smoke rising from chimneys or roll around in dust. They grease their feathers every two to three days. Mated pairs and siblings engage in mutual preening. On colder days, they can be seen sunning themselves on favorite posts or perches. Most hunting occurs at night or dusk, but they also hunt during the daytime. Little Owls feed on various insects (such as beetles, crickets and earwigs), earthworms, reptiles, frogs, fish, mollusks, and will also take small mammals (rodents) and other birds, sometimes even attacking prey their own size. They eat considerable amounts of insects, which may form up to 98 percent of their diet, as well as preying on rodents - effectively keeping the populations of these pests under control. They also take plant materials, such as grasses and leaves, as well as fruits, berries and maize. They often catch prey on the ground, while running or hopping. They also hunt flying insects or small birds in mid-air. Males usually carry their prey by the head, while females seem to prefer to carry them by their necks. Smaller prey is picked up using the bill and larger animals are snatched with their feet. Indigestible parts of their food are compacted internally and regurgitated as pellets. Any surplus food is stored (often in holes they dug themselves) and retrieved as needed. Little Owls are monogamous, possibly remaining together for at least the duration of the breeding season, but many times they remain together until one of them perishes, at which point a new mate is selected. The breeding season usually commences in early February and usually goes on until May and in rare instances until August, depending on the region. They usually only produce one a clutch a year, but may replace a lost clutch. Depending on their habitat, they nest in rabbit burrows, tree cavities, cliff and rock crevices, river banks and in old buildings, as well as accepting artificial owl nest boxes. The male maintains a breeding territory and selects various nests within this territory and presents them to the female until she makes the final selection. The nest is scraped out and cleaned before any eggs are deposited in it. 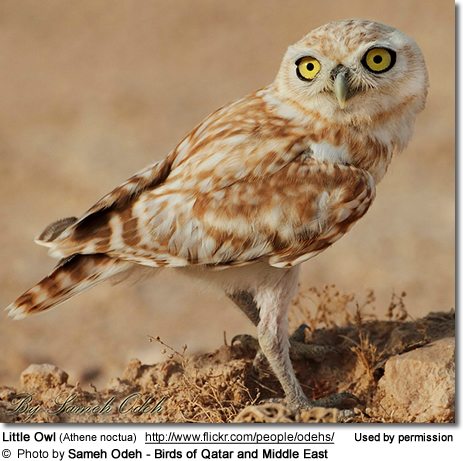 Little Owl nests may be as close as 1,800 feet (~ 560 meters) from each other. The average clutch consists of 3.3 eggs; normal is a clutch of 3 - 6 eggs, but in some rare instances only one or as many as 12 eggs have been reported. If the first clutch is lost for some reason (usually predation), another - smaller - clutch may be produced. The eggs are incubated by the female alone for 18 - 35 days, but in most cases, it is about 28 - 29 days. The tiny hatchlings only weigh 0.35 - 0.42 oz (10 - 12 g); they are blind and are covered in short, white down. These helpless chicks require the female's constant attention and she will remain with them, and brood them, for about 16 days. During this time, the male hunts and brings food to the female and the chicks. As the chicks grow older, the female joins the male in hunting prey. Chick mortality is quite high, as they are preyed upon by other birds, small mammals and reptiles, and only about 0.6 - 2.8 fledgings out of each clutch survive. The young fledge (leave the nest) when they are about 26 days old at which time they begin catching their own prey, a skill which they master about one week after fledging. They are usually independent when they are 12 - 16 weeks old. They reach reproductive maturity at one year. Little Owls are very loyal to their nest sites and there are records of them reusing them for over 25 years. Their calls are described as whining kee-ik, mewing and yelping. 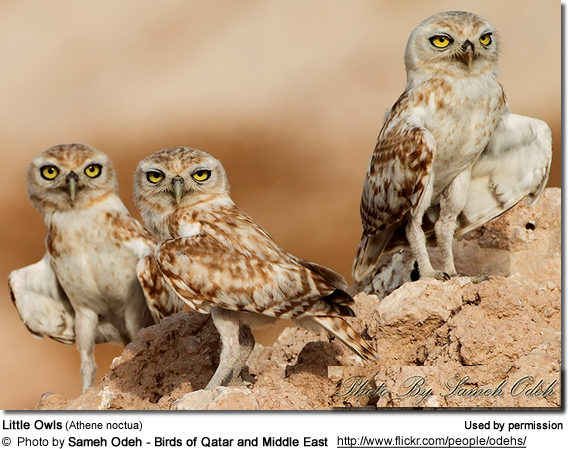 When displaying for females, the males voice a mellow hoot, “gooek”, which rises in pitch; and both genders make repeated loud “hoo” vocalizations. They are generally most vocal before and during courtship and less so outside the breeding season. Additionally, there is an increase in call duration at dusk, referred to as "dusk chorus" and less pronounced increase at dawn. The female's calls are usually shorter and higher pitched than the male's. Male vocalizations are louder and clear than female's. The oldest recorded Little Owl lived 15 years and 7 months. The average lifespan is about 4 years; due to the high mortality rate of juveniles of about 69 - 94%; and adults 24.2 - 39% each year attributed largely to predation, parasites, weather conditions and habitat destruction. Birds: birds of prey, including owls (tawny owls, barn owls, eagle owls, long-eared owls), booted eagles, imperial eagles, tawny eagles, peregrine falcons, common buzzards, goshawks, sparrow hawks, red kites, black kites, rough-legged buzzards, lanner falcons, marsh harriers and long-legged buzzards. When confronted, they will bob up and down and move from side to side..